I have just been nominated for the One Lovely Blog Award. A huge thank you to AliciaEatsHerWay for the nomination. You should definitely journey over her way and check out her blog. I am not totally sure what the One Lovely Blog Award is totally all about but I have found out that once nominated I need to pass on to you at least 10 blogs that I like and enjoy. I also need to give 7 fun facts about myself that you may or may not know. AliciaEatsHerWay – I have found this blog to really interesting. I am learning a lot of new things about food, food prep and a healthy way of eating. I also learned you can use an entire carrot as food. And thank you for nominating The Chicken Grandma! Tell His Story – This is a great faith based blog. In an earlier post I had included a link for her new book The Happiness Dare. I love how Jennifer weaves faith through her everyday life story. goldenbrodie – The Brodie Here page on this blog is hilarious. It is written from a golden retriever named Brodie’s point of view. Light hearted and lots of fun. Her pictures are also great. A Nene’s Life – Another blog I love. The author covers everything from her child’s wedding, the granddaughter, hot flashes to DIY furniture restoration. Definitely one to check out and enjoy. Nandini – This is a food based blog. Her pictures are amazing and make you want to go get those ingredients and get in the kitchen. She has all sorts of great tips and goes into detail complete with photos. Tammi Kale – I am so glad this woman stopped by my blog so I could lead back to hers and check it out. A woman of faith and convictions who is not afraid to tell her story. I am looking forward to getting to know Tammi better. theDaddyBlitz – This man, husband and father of 5 sons blogs about family, religion and politics. (He is indeed fearless to take those on!) His insights are good and I really enjoyed his post on Wile E. Coyote Parenting. Goats and Grace – This is a new one I have discovered and I am really enjoying it. The first post I read from this author was about her dad. She is so very proud of him and I love that. I highly recommend this blog. HelbergFarmStories – a good read on farming, gardening and all the things that are so much fun to try. The Free Gift – This one is by a college gal who is making her way through life. It is full of her journey and encouragement for others making the same journey. She does not post often but when she does it is a great read. SmokedFishHoney – This is a great place to look at beautiful pictures. The photography is amazing. The Vanilla Tulip – I cannot believe I forgot to add this blog to my list! I will confess this gal is my niece and she is an amazing mom. 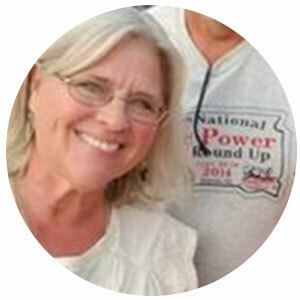 She covers topics such as living thrifty, home-schooling, and food. Make sure to check it out. I love to share things so I went over the 10 and gave you 12! Enjoy! I love a good joke. If it is on me that is okay. If it is on someone else (as long as it does not hurt them emotionally or physically) it is all good. My faith and my family are the center of my life. Anytime I can have my husband, kids, and grandkids around -all at the same time- I am loving it. Throw in my siblings, parents and the in-laws and life just got better. I love to travel and see things. If I had the finances I would do a little globe-trotting. God created a big world out there and I would love to see as much of it as I can. I do not like pictures of myself. I am getting over this one after reading somewhere that if you never let your picture be taken; how will your grandkids be able to remember what you looked like. I do, however, like to be in the back row of a group photo but when you are short that does not happen very often. I have learned more lessons on living life and getting along just from watching “my girls” (chickens). Living in the country has given me an appreciation for the things around me and allows me to have chickens. One of my favorite things to do is sit on our porch with my husband in the morning, have a cup of tea and listen to the birds singing in the gully. This would be pre-mosquito season…. Thank you all so much for stopping by. I look forward to getting to know all of you. That is one of the best things about blogging. I am finding out people are pretty much the same wherever they come from. We all have dreams, hopes, love our families and want to make a difference in some way. Thanks so much for this award! It means a lot. Aww, thanks for nominating me. I really appreciate it and I love reading your blog. Now I have to check out the others you have listed here! Thanks for this list! I’m looking forward to reading these. I really enjoy your blog. I love yours as well!! Congratulations!!! Thank You Faye, you are very kind to mention me in your list. It was well deserved! I always love to see what you are making next. Chicken grandma you are definately my favorite blog! I truly look forward to your new posts. You are coming from such a genuine place with your thoughts and experiences. Please know that Brodie and I love your stuff! Thank you so much! I love reading yours. I love your pictures of Ireland also. I get to see the world through you.